West Heavens is an integrated cross-cultural exchange programme initiated in 2010. It aims to untangle and compare the different paths of modernity taken by India and China, to facilitate high-level communication between the two countries' intellectual and art circles, and to promote interaction and cross-references between the two countries through social thoughts and contemporary art. 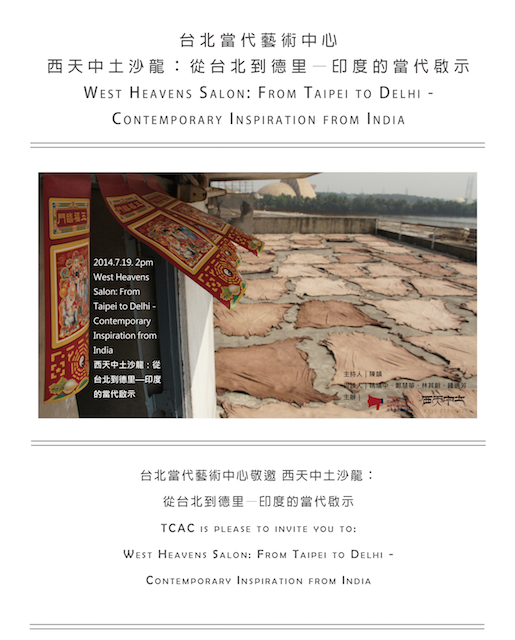 This time, West Heavens invites Taiwanese artists, curators and scholars who have visited India in past two years, to address their own observation and experience, sharing how they were inspired to examine their own values, attitudes and beliefs with a clearer and fresher vision. Chen Yun moderated a conversation between four artists and curator, Yao Jui-chung, Amy Cheng, Lin Chi-Wei and Chung Shefong. The discussion was based on their experiences in India through the West Heaven program. Chen guided the conversation towards the complex culture in India, the diversity and it’s relation to the it’s neighboring country - China. Before their trips to India, all four of the artist expressed that they had vague generalizations of what India would be like from it’s rich history, yet are less familiar with its modern culture. Thus, when arrived in India they all experienced different levels of cultural shock as they personally experience its rich diversity and multi-racial culture. Yao for instance was shocked by the extreme amounts of propaganda, social movements and riots within the universities. Chung on the other hand, have been in contact with indian culture since growing up although never step foot on the land until this project seem to have a very different experience. Through this experience in India she was able to put the missing pieces together and grasp what it truly feels like to be in India. Amy and Lin had more of a conventional cultural shock, they were surprised with the intense constant noise during the day and the diverse amount of flavors within the cuisine. The three artist and one curator looked at very different aspects of the Indian society, yet all in correlation to the modernization of its society. They looked at issues such as racism, sexism, classism, the different political stances and the division of the poor and the rich. They discussed that the modern culture in India has resulted in a large gap between the rich and the poor, furthermore there is a large population living under the poverty line in India. The experiences of those who live in the slums is completely unimaginable, a completely different experience challenging all our prior knowledges of what we can experience through our six senses. The borderline communities in India is also another area of discussion. They were interested in what meant to live under a hierarchy system and consequently what it meant to be part of these borderline communities that are outside the hierarchy. Furthermore they looked at western influences, the results and aftermaths of colonial India. After the discussion of India and it’s complex and diverse culture. The four artists and curator realize that a lot of the issues that arise among the indian society is not exclusive to the indian society and those issues are more closely related to the modern chinese society than we imagine. Chen Yun concludes that sometimes the smaller issues are deeper than one thinks and what one often expects is different from reality.